Packington Stockists Shine with Industry Awards | Packington Free Range | Born and reared outdoors. Always. Three of Packington’s major UK stockists have been busy this Spring, not only with bringing home the bacon, but also a few awards as well. Jon Thorner’s (http://www.jonthorners.co.uk/), Cheerbrook Farm Shop (http://www.cheerbrook.co.uk/) and JW Mettrick & Son (http://www.mettricksbutchers.co.uk/) have all won prestigious industry awards for the quality of their produce, created using Packington meat. Shepton Mallet-based butchers Jon Thorner’s are no newcomers when it comes to winning awards. In March the butchers won a double prize from the Meat Expo 2013 Awards in Belgium, bringing home a Gold Medal for their Pork Pie and Silver for their Pork Loin Roast. JW Mettrick’s were also recently awarded two coveted awards for being exceptional butchers within the industry – Butcher of the Year in the Countryside Alliance annual awards, and Master Butcher under the Meat Training Council’s accreditation scheme. The first was held at the Houses of Parliament and the latter awarded to owner John Mettrick by HRH Princess Anne –both momentous occasions. John is the first Master Butcher in the North West, and only the 10th to be given the title in the UK in praise for his understanding and management of the supply chain. 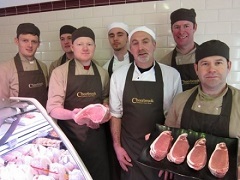 And thirdly, Nantwich-based Cheerbrook Farm Shop proudly collected the Overall Butchers’ Winner trophy for its traditional dry cured back bacon in March. The award was presented at The Great Bacon Revolution Awards as part of Bacon Connoisseurs Week, a campaign which Packington also supported with our own local campaign. Have you tried our Staffy Sandwich yet? Thorner’s, Cheerbrook and Mettrick’s can all be very proud of their accolades for creating quality meat products – we’d like to congratulate all three of them for their achievements.